Cliffy B: Not One, But Two Game Reveals On Monday! What do you do when your (not-so-)surprise game announcement is accidentally announced by someone else beforehand? You plan to announce another one, if you're Epic Games' Cliff Bleszinski. CliffyB, as he is perhaps better known (to his great chagrin) was all set to announce a new game on Late Night With Jimmy Fallon last night - however, scheduling conflicts (and a desire on Epic's end for some additional last-minute polish) led to a reschedule, with the announcement planned for Monday. However, apparently nobody told Microsoft's Xbox Live team, and the wholly-unexpected (and good God am I being sarcastic) Gears of War 3 was accidentally revealed before CliffyB could do it himself. But with the wind taken out of his sails, was Epic's frontman just going to give up? Come on. Would Marcus Fenix give up? Instead, Bleszinski is just going to make the announcement spicier by announcing not one, but two games! That's according to his Twitter account, anyway: "NEWSFLASH: Two announcements about two upcoming games on Monday. BOOM!" The other game could really be anything (Unreal 4? Jazz Jackrabbit? Gears of War HeartGold Version?) 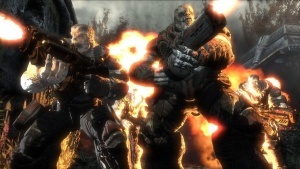 but is most likely People Can Fly's long-rumored title Bulletstorm. But that's just speculation, so don't hold us to that. Instead, hold Game Informer to it, since that's the game on the cover of next month's issue.